In previous articles, we saw how Jesus the Messiah is Isaiah's YHWH and Malachi's YHWH. We saw how Isaiah had prophesied that YHWH would come to earth in the form of man, and how Malachi prophesied that He would come to His temple. We also saw how that Man was Jesus the Messiah. We know that the prophet Jeremiah is referring to Jesus as the Righteous Branch of David, because Isaiah also calls Him "a Branch out of the stem of Jesse" and "the Branch of the Lord." And we know that the Righteous Branch is Jesus because all of these titles are references to the Coming Messiah and Jesus is that Messiah. While this prophecy from Jeremiah still awaits fulfillment, the focus of this passage is salvific righteousness which, as all Christians know, only comes from God. Only God can save us and bring us into His Kingdom. The Bible is clear in its teaching that man's own righteous acts gain him nothing in terms of his salvation (Psalm 14, Psalm 53, Ecclesiastes 7:20, Isaiah 64:6, Ephesians 2:1–5, Romans 3). We see this as early as in Genesis 3, right after Adam and Eve succumbed to temptation and fell into sin, and were evicted from the Garden as a result. But before YHWH sent them out, He clothed them in skins, which implies that the first death had occurred in the world. The first time death came into the earth was when the blood of an animal was shed to cover the body of sinful man. The message is clear: sin brings death. Now, if, as some claim, God's standard of justice is so low and His forgiveness so easily secured, why would God have needed to eject Adam and Eve from Paradise? Why didn't He just forgive them and leave them in the Garden? Why did blood need to be shed and a Plan put into motion for YHWH to send the Messiah? Obviously, God's holiness and justice are not as easy to meet as some would like to believe. And His teaching in the Old Testament about the Law (there are 613 of them in the Old Testament and over 800 commands in the New Testament) makes that quite plain. God's standards for holiness and justice are higher than any man can ever attain on his own. And that is why YHWH sent us His Son, Jesus. Only the sinless and perfect Son of God Himself could ever have lived in a way that would glorify the Father. Only the Son could ever have met God's pattern for holiness and obedience. Only the perfect Sacrifice that was the Son could end the bloodshed once and for all. 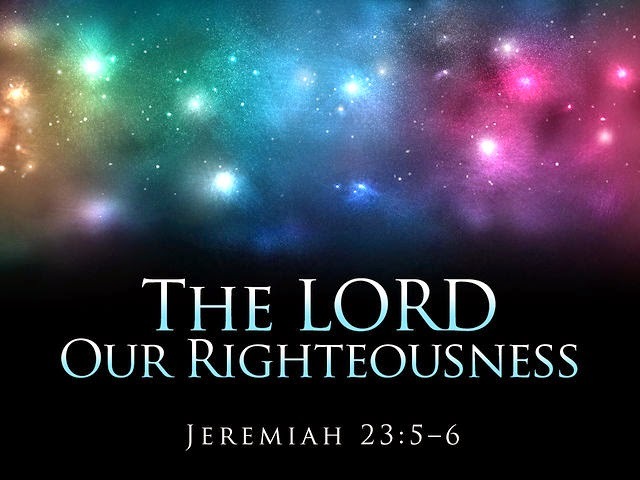 Jeremiah told us that when Messiah came, He would be named "Yahweh Our Righteousness." This is why Jesus is called the "Righteous Branch of David... Who will reign wisely as king and administer justice and righteousness." Because Yeshua the Messiah is Yahweh!